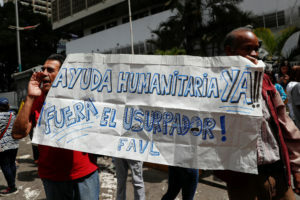 WASHINGTON — The International Committee of the Red Cross has warned the United States about the risks of delivering humanitarian aid to Venezuela without the approval of security forces loyal to President Nicolas Maduro. Opposition leader Juan Guaido has said he will defy Maduro’s refusal to allow humanitarian aid by asking neighboring nations to help send in large convoys of medicine and food. Guaido has declared himself interim president of the country. ICRC will also dedicate $35 million to Colombia to assist in areas where former FARC rebels maintained a presence and to care for more than three million Venezuelans who have fled the economic crisis in their country.